Maw-sit-sit (Mawsitsit or Maw sit sit): the green out of Burma. I am very often asked: what is that you are wearing?! Most people have never seen fine quality maw-sit-sit. Found in only one deposit on earth so far, maw-sit-sit is reported to have the highest concentration of chromium found in any rock on earth - that accounts for its extraordinary color. 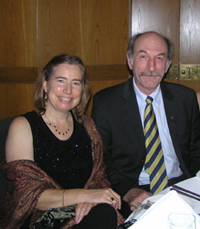 At the 2008 Centenary Conference of the British Gemmological Association just recently held in London, many of my fellow delegates stopped to ask about my pendent. As is often the case, ID tags get flipped, so when one familiar looking gentleman in particular approached me with obvious admiration for this green wonder, we quickly established a shared obsession with a green rock; it was several moments before I realized I was speaking with Prof. Henry Hänni - distinguished researcher and professor at the Swiss University at Basel and the SSEF laboratory - an authority and author on the very subject of maw-sit-sit! As familiar as I am with his published papers, I had not had the pleasure of meeting him previously. Long conversation and correspondence since has resulted in the presentation below of Prof. Hänni's research regarding maw-sit-sit. A discussion of maw-sit-sit can not begin without first exploring the properties of jadeite. From there, one proceeds to the complex nature of this material. What follows is from personal communication with Prof.Hänni in which he shared some of his extensive research on this fascinating and beautiful stone. All text and images are copyrighted by H.A. Hänni unless otherwise attributed and may not be reproduced. Transparency in Jadeite. Photo: H.A.Hänni. With this paper, a short report is given on three major questions that may arise when one reflects about jadeite as a member of the gemstone family. These questions are: why is jade not transparent? why is jade green? and why are certain "constants" not always constant? Most gemstones are transparent monocrystals and end up as facetted stones. Semitransparent or translucent or opaque gem material is worked to cabochon cut stones. The reason jadeite can be translucent or opaque is its polycrystalline nature and the grain size. 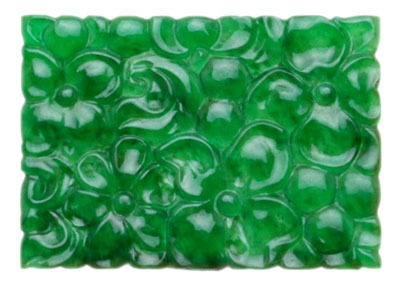 A piece of jadeite consists of a blocky mosaic of thousands of crystal grains. Their structure is described as fibrous to granular, from fine- to coarse-grained. Their grain boundaries, particularly when widened by weathering, inhibit a straight light path and diffuse the light in a stone. Filling these minute gaps with transparent media (wax, epoxy a.s.o.) improve transparency. We are aware of the processes that make use of the rather porous jadeite for acid-treatment. After cleaning out the deposited secondary minerals (iron oxide) the gaps are filled with colourless material. 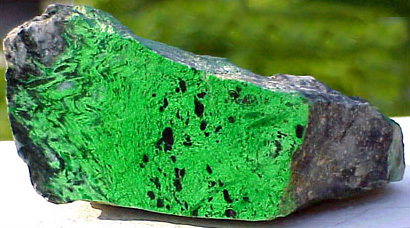 This treatment leads to B-jade, or with dyed material, it leads to C-Jade. Fig. 2 Scanning electron-microscope picture of a polished surface of weathered jadeite. Each jadeite grain is surrounded by a narrow gap at the grain boundary. In B-jade and C-jade these openings enable an introduction of organic filler like epoxy or dye. The tiny openings are responsible for a frequent poor polish of B-jade. Photo: M. D�ggelin, ZLM, University of Basel. The mono-mineral structure can also bear foreign minerals, and the way down to a rock i.e. an association of different minerals is open. The gemstone concerned is Maw Sit Sit, the material that is closely related to jadeite. It occurs in the classical jadeite area in Burma (Namshawa, 10 km north of Lonkin) and comprises a number of other minerals, such as chromite, kosmochlore, jadeite, Cr-jadeite, Cr-eckermanite, symplectite, zeolithes, albite and serpentine. The densities vary between 2.5 and 3.2 g/cm3, according to the variable mixture of minerals. Fig. 3 A piece of Maw-Sit-Sit,a jade-related rock from Myanmar (Burma). The material contains at least eight different minerals and may change its visual aspect strongly with the ratio of the composing minerals. Photo: H.A.Hänni. While ideal minerals possess a simple chemical formula to express their composition e.g. 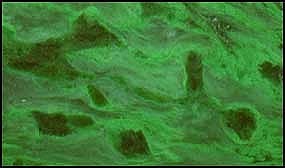 Jadeite NaAlSi2O6, real gemstones usually contain admixtures that can go to considerable scales. Generally small amounts of foreign elements which are responsible for coloration are covered by the term "trace element". A trace element is thus not a specific element, but any element at a certain low level below 0.3 %. When the level is higher we use the term "minor element" that goes up to a level of 5 %. Major constituents of a chemical formula are "main elements." Interesting is to see the role of chromium in jadeite, depending on the amount: it may be a trace- a minor element or a main constituent. Let me explain this in more detail. We are used to say that a nicely green jadeite owes its green to a trace of chromium, characteristically around 0.5 weight percent. When higher amounts of Cr are present, the colour goes to dark green or even black. Together with this increase of Cr, certain "constants" such as RI and SG increase in value. And the question may arise: how much Cr can a jadeite digest? Fig. 4 An engraved piece of semi-transparent jadeite with an estimated content of 0.6 wt% Cr2O3 or a kosmochlore content of approx. 1.6 mole %. Photo: H.A.Hänni. Here we must discuss a concept that is helpful in the science of mineralogy. The concept of a so-called "solid solution" between two well-defined end members is used in mineralogy to describe mixtures between so called end members. These admixtures refer to ions in the crystal lattice, rather than to mineral grains. The crystal lattice is a geometrically defined pattern of order for constituents of the mineral composition. Certain identical positions in the lattice may be occupied by differing ions of similar size and same charge. Since aluminum Al and chromium Cr have a similar ionic size and same 3+ charge they are exchangeable in the crystal lattice. And because a mineral grain is composed of million times the mineral formula, there is a frequent possibility to occupy the 3+ lattice site with Cr instead of Al. It is just the availability of Cr during crystallization that governs the extent of replacement. And this situation exactly depicts the solid solution scenario between the end-members jadeite NaAlSi3O6 and kosmochlore NaCrSi3O6. The middle point of this series is represented with the formula Na (Al0.5 Cr0.5) Si2O6. This two component mixed crystal situation is also applicable to the pyrope-almandine series of garnet, where the well-known rhodolites are represented with a pyrope85/almandine15 ratio. With jadeite we face two main compositions that form chemical admixtures: kosmochlore and omphacite, related minerals that go into solid solution with jadeite. 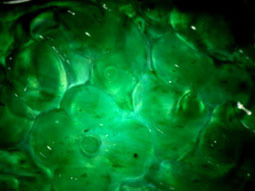 While kosmochlore covers the Cr admixture in real jadeite, omphacite covers the Ca, Mg and Fe encountered in jadeite. 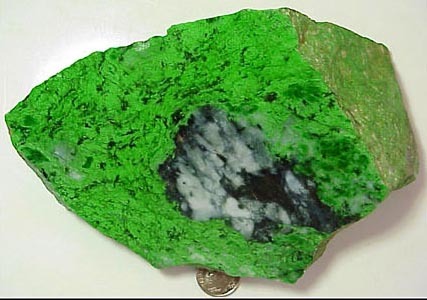 We can now discuss how much of a foreign component of either kosmochlore or omphacite is allowed in a jadeite so that it is still regarded as jade. A solution is proposed by the new Hong Kong standard of Fei Cui Jade that gives upper limit values for RI as 1.688 and SG as 3.40. The discussion here is still related to a monomineralic and polycrystalline mixture of members of the Jadeite-Kosmochlore series. The natural Fei Cui jade may, of course, also contain foreign mineral grains such as chromite that move the SG to higher values. Fig. 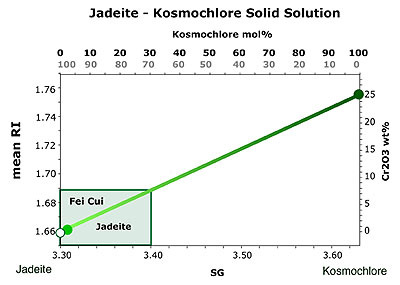 5 Simplified graph showing the relationship of density and mean refractive index in the two-component system of jadeite and kosmochlore. The curves for SG and RI show a linear relationship with the degree of substitution. 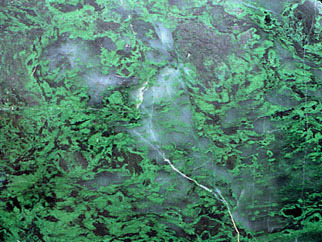 A solid solution of jadeite with omphacite would have a similar increasing effect as that of the kosmochlore admixture. The green field shows the data that include the Fei Cui jade. Photo: H.A.Hänni. The colors of maw-sit-sit Photo: H.A.Hänni. Maw Sit Sit is a rock, composed from at least six different minerals as main constituents. Those can vary greatly in their relative amounts and therefore the rock may vary strongly in its visual aspect as well as in its specific gravity value. The name Maw Sit Sit is given by the local people and (recalls) the locality of origin near Kansi and Namshawa, N-Burma (Myanmar). Previously used names in the west were Jade-Albite or Chloromelanite. 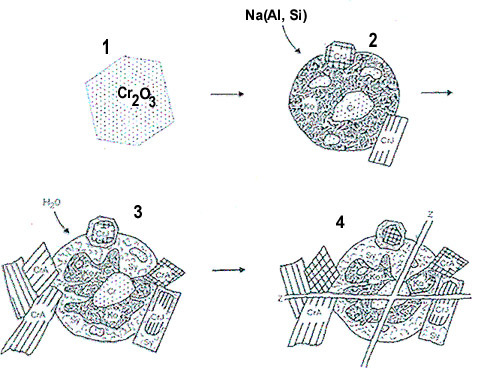 Semi-schematic drawing of a thin section of MAW SIT SIT, containing the different elements (present in variable realtive amounts) of this complex rock: ( 1 ) relictic chromite; ( 2 ) fine - felty kosmochlore; ( 3a )	larger single crystals of Cr-jadeite; ( 3b ) blocky mosaic of Cr-jadeite; ( 4 ) symplectite (mainlyCr-jadeite); ( 5 )	Cr-amphibole (arvfedsonite); ( 6 ) matrix consisting of zeolite (thomsonite) or albite or serpentine, sometimes with small idiomorphic crystals of Cr-amphibole; ( 7 )	veinlets (cleft fillings) of serpentine or zeolite. Image: H.A.Hänni. Chromite small black relictic grains of metallic luster, mostly as cores in black Kosmochlore aggregates, provided they show central grains of higher luster. 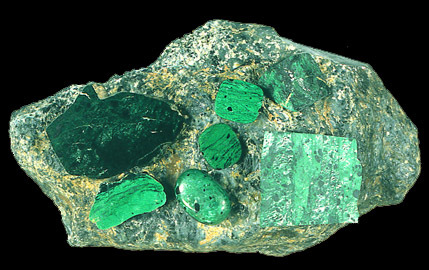 Chrome-Jadeite is encountered as larger single crystals forming blocky mosaics. There is a solid solution or mixed series situatuation between Jadeite, Chrome-Jadeite and Kosmochlore by the substitution of Al by Cr. In Maw Sit Sit usually various members of this series are present. 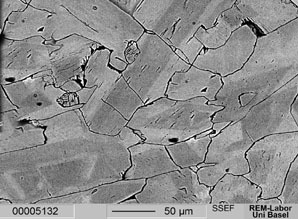 Symplektite is a very fine mineral mixture which cannot be resolved microscopically. 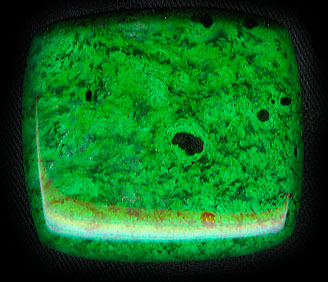 Symplektite is also green due to the chromium content of its components. Chrome-Amphibole or Amphibole, in larger crystals, depending on its chromium contents green or grey. After their chemical composition they were identified as Eckermanite bzw. Arfvedsonite. Matrix is a mixture of bright mineral components (Zeolite, Chlorite, Albite, Serpentine) which fills the space between the minerals named above. Fine veinlets mainly also consist of Zeolite, Chlorite, Albite or Serpentine. Maw Sit Sit was formed in connection with a high pressure low temperature rock metamorphosis which affected an ultrabasic body locally. New formations of minerals also took place after the culmination of the metamorphosis. Essentially it was a rmetasomatic reaction between serpentinites and albitite dykes. The chromium which is found in most of the constituent minerals most probably stems from former chromite layers which have been dissolved during the metamorphic transitions. Remnants of chromite are sometimes found as relicts within the Kosmochlore spots. 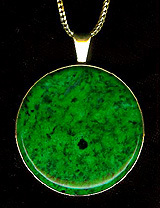 The Maw Sit Sit deposit is placed at the rim of a larger peridotite body which has been altered and serpentinized. The deposit is northern and close to the classical jadeite location in Burma (Tawmaw, Namshawa). 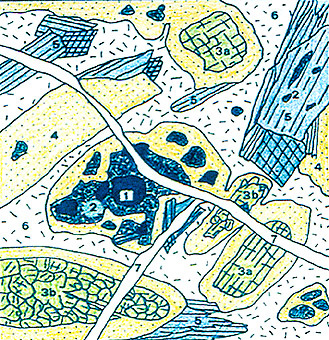 Semi-schematic drawing of a thin section of maw-sit-sit, containing the different elements (present in variable realtive amounts) of this complex rock: ( 1 ) Chromite nodules in peridotite; ( 2 ) High pressure metamorphism.Na, (Al,Si)-metasomatism and formation of kosmochlore from chromite, plusCr-jadeite in larger crystals; ( 3 ) Retrograde formation of symplectite, a mass of submicroscopic grains of r-amphibole, thomsonite, albite, deriving from kosmochlore and Cr- jadeite. Local formation of larger crystals of Cr-amphibole by influx of H2O; ( 4 ) Late formation of zeolite and albite, often in veinlets and cleft fissures. Image: H.A.Hänni. Mawsitsit is named for its source location, the small village of Mawsitsit, located just a few kilometers from the town of Hpakant, in remote NW Burma, famed for the Imperial Jadeite found there. 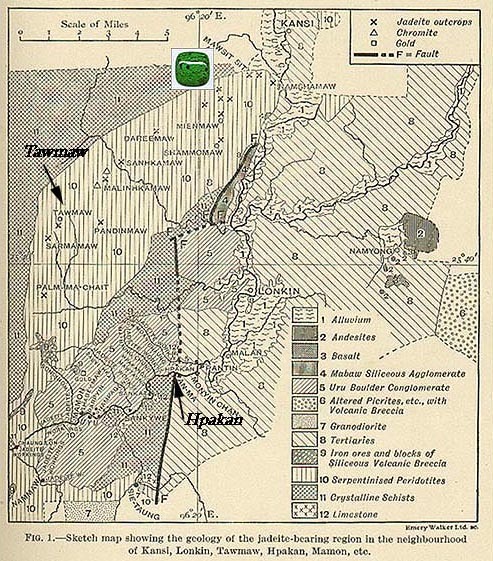 The above historical map shows the famous Jadeite Deposits near Hpakan (Hpakant), Burma. This map is taken from the excellent reference on Burmese mineral resources (including gemstones): "The Mineral Resources of Burma" by Harbans Lal Chhibber. This rare book was published in 1934 and was quite a lucky find for someone passionate about Burma and maw-sit-sit. Colours of Maw Sit Sit : light green to black, monochrome, mottled or spotted, frequently with black spots or white spots and veinlets. Maw-sit-sit is the name of a locality, and also the local name for the described rock in Myanmar (Burma). Chloromelanite is an older mineral name of a pyroxene mineral which is not part of Maw Sit Sit. It might also be in use due to its descriptive name for "chloros = green" and "melanos = black". Jade-Albite is a name composed of two mineral names which may occurr in Maw Sit Sit, but are subordinate and less frequent so that it is not justified to use them for naming the stone. A friend who has made his home in Thailand also shares Prof. Hänni's and my passion for maw-sit-sit. I will never forget time spent examining cut pieces together - so much green! A trained geologist traveling regularly to Burma to obtain rough, he has perfected the art of cutting and polishing this material. Quite a feat given its make-up of several minerals of varying hardness which makes this process very difficult; not many can obtain this level of perfection. Some of the images on this page are ones which he has shared with me of the material as it comes from the ground, as well as a fabulous map detailing the deposits in Burma (Prof. Hänni also had the same map, but I could not make a good reproduction of it for this webpage). References for "A European Gemmologist's Thoughts on Jadeite Jade:"
Abs-Wurmbach, I. & Neuhaus, A. (1976): Das System NaAlSi2O6 - NaCrSi2O6 (Kosmochlore) im Druckbereich von 1 bar bis 25 kbar bei 800 oC. - N.Jb.Miner.Abh. 127, 213 - 241. G�belin, E. (1964): Maw-sit-sit: A new decorative gemstone from Burma.- Gems & Gemology, XI, 8, 227 - 238. Hänni, H.A. & Meyer, J. (1984): Is there a gap in the solid solution between jadeite and Ureyite? (German original title: Besteht eine Mischungsl�cke in der Reihe Jadeit- Ureyit). Paper verbally presented at Bern-Basel Colloquium in Bern. Ou Yang, M.C. (1984): A terrestrial source of Ureyite.- American Mineralogist, 69, 1180 -1183. Ou Yang, M.C. (1993): Microscopic studies of Burmese jadeite-jade.- J. Gemmol. 23, 5, 278 -284. References for "Maw-sit-sit (Kosmocholore-Jade): a metamorphic rock with a complex composition from Myanmar (Burma)"
Abs-Wurmbach, I. & Neuhaus, A. (1976): Das System NaAlSi2O6 (Jadeit - NaCrSi2O6 (Kosmochlore) im Druckbereich von 1 bar bis 25 kbar bei 800 oC. - N.Jb.Miner.Abh. 127, 213 - 241. Harlow, G.E. & Olds, E.P. (1983): Terrestrial ureyite: occurrence and significance.-EOS 64, VS1B: 10. Leake, B.E. (1978): Nomenclature of amphiboles.- Am.Mineral. 63, 1023-1052. Meyer, J. 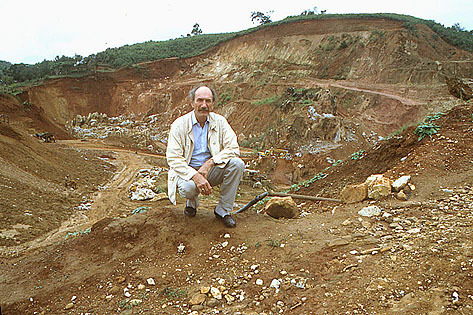 (1983): Mineralogie unbd Petrographie des Allalingabbros.- Inauguraldissertation, Universit�t Basel. Ou Yang, M.C. (1984): A terrestrial source of Ureyite.- American Mineralogist, 69, 1180 - 1183. Ou Yang, M.C. (1993): Microscopic studies of Burmese jadeite-jade.- J. Gemmol. 23, 5, 278 - 284. Robinson, P., Spear, F.S. & Schumacher, J.C. (1982): Phase relations of metamorphic amphiboles: Natural occurence and theory.- in "Amphiboles: Petrology and experimental phase relations. Reviews in mineralogy, Vol. 9b, Min.Soc.